After the close of World War II, the United States toyed with the notion of the "Flying Wing" (the idea being to minimize drag). The pinnacle of this program was the jet-powered "Flying Wing". The maiden flight of this massive brainchild of designer Jack Northrop was on October 21, 1947. The plane was one of the fastest big bombers of its day and could fly at 500 miles per hour. In 1948, it set an endurance record by staying aloft for nine and a half hours without refueling. The YB-49 program was eventually dropped in favor of the B-36 because, among other things, it could not carry the heavy atomic weapons of the era. Jack Northrop's Flying Wing was a revolutionary design for its day. Designated the YB-49, it was on a test flight from the Muroc Air Force Base in California on June 5, 1948 when it went out of control and crashed. It took off from Muroc AFB, now Edwards Air Force Base, at 06:44 in the morning for a scheduled three-hour test flight. On board were Pilot Daniel H. Forbes, Co-pilot Glen W. Edwards, Clare C. Lesser, Edward L. Swindell and C. H. LaFountain. At 07:55 AM, it was seen to go out of control and fall to the ground inverted. The point of impact is about twelve miles northwest of Muroc AFB, and eight miles east of the town of Mojave, California. The resulting fire turned much of the aircraft into pools of molten aluminum on the desert sands. 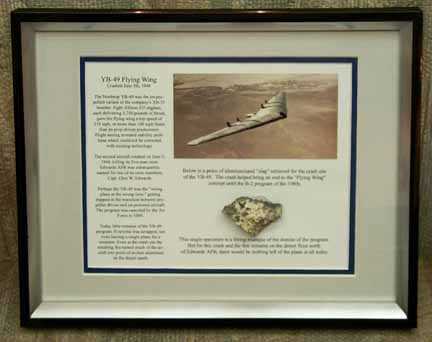 Retrieved from the crash site, this piece of aluminum/sand "slag" is a reminder of that crash and the death of the "Flying Wing" until the B-2 program of the 1980s. For more about the crash site, click here.